This October Adam James can be seen alongside Emma Thompson and Rowan Atkinson in the latest instalment of the hilarious Johnny English franchise, playing Pegasus the head of MI7, in ‘Johnny English Strikes Again’. 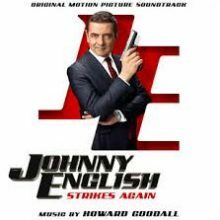 The new adventure begins when a cyber attack reveals the identities of all active undercover agents in Britain, leaving Johnny English as the secret service’s last hope. Out tomorrow on general release.